Just show us a description of a restaurant, store or hotel that includes the words “authentic experience” and “unique environment” – usually all in one breathless sentence – and we are already rolling our cynical, PR-weary eyes. We envision fake me-toos and done-a-million-times-already concepts with boring and uninspiring gimmicks. Sometimes we wonder how entrepreneurs can afford to even try such unoriginal concepts in today’s competitive market. One such market where the uninspired need not apply is the trendy Roppongi district in Tokyo. Attempts at unique environments or experiences survive there only if they really do deliver what they promise. 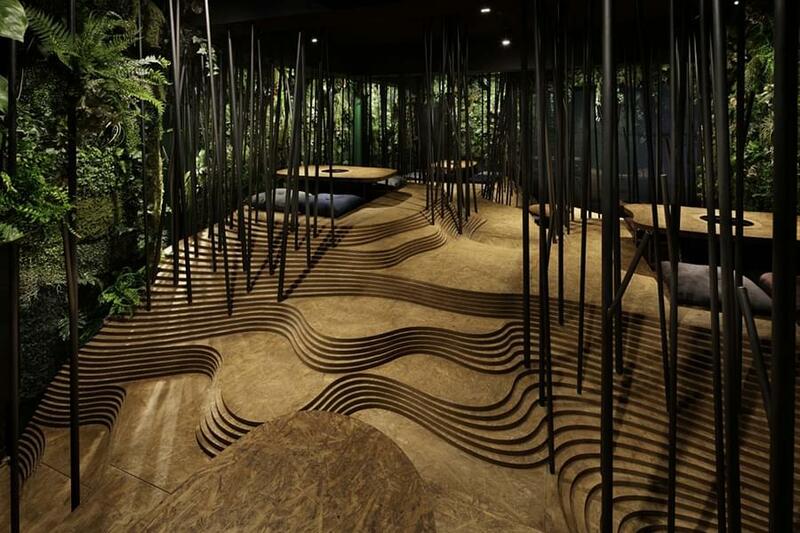 After a year in business, the Nikunotoriko restaurant designed by Tokyo-based architect Ryoji Iedokoro seems to be an example of those that have succeeded there. The restaurant’s name is translated as ‘under the spell of meat’, and the style of food offered is ‘premium yakiniku’ or premium grilled meat cuisine. Iedokoro referenced the primal hunter humans who gathered inside a cave or outside in a forest to sit around a fire to cook and share their catch. 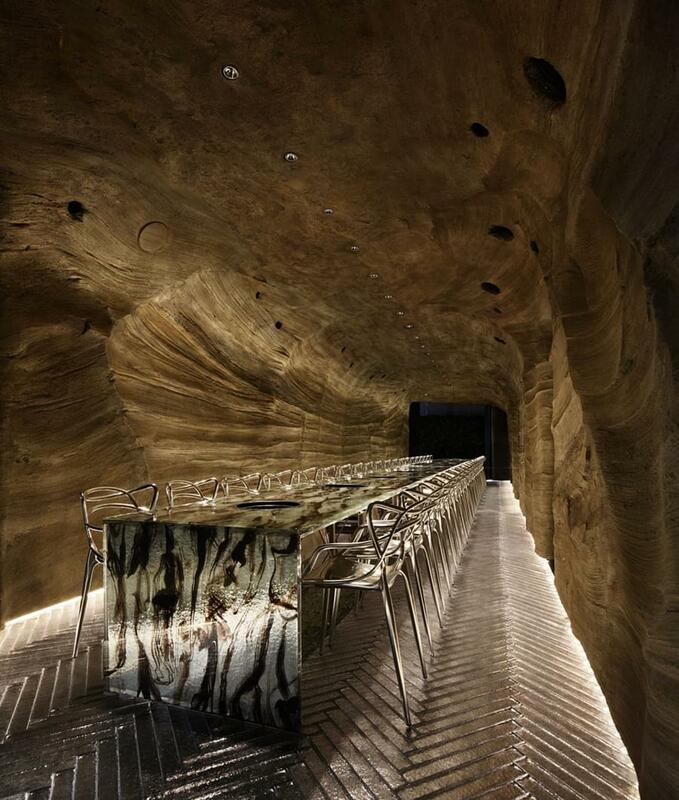 His attempt was to create an environment that evokes caves, forests and creeks where the patrons gather together to forget the urban bustle of the city and share a meaty dinner. 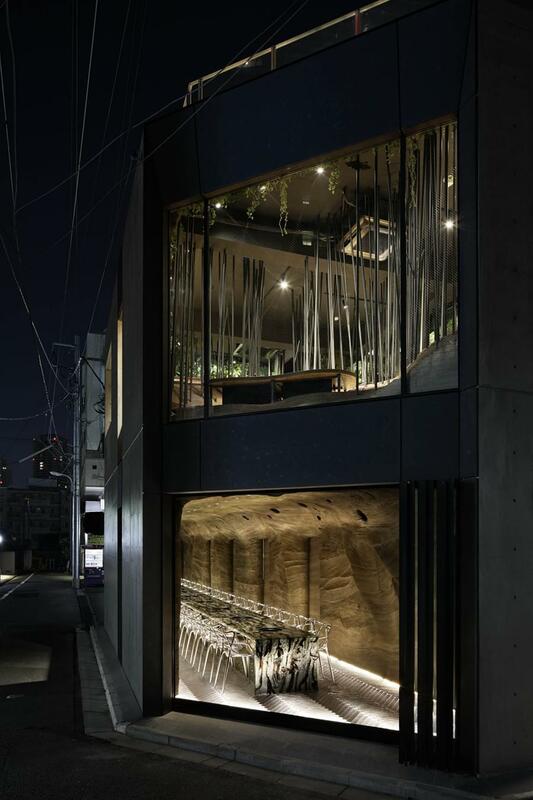 The two-level restaurant is located in a new building in the heart of the Roppongi area. Each floor is about 65 square meters (700 sq.ft) in size and each seats about 20 guests. 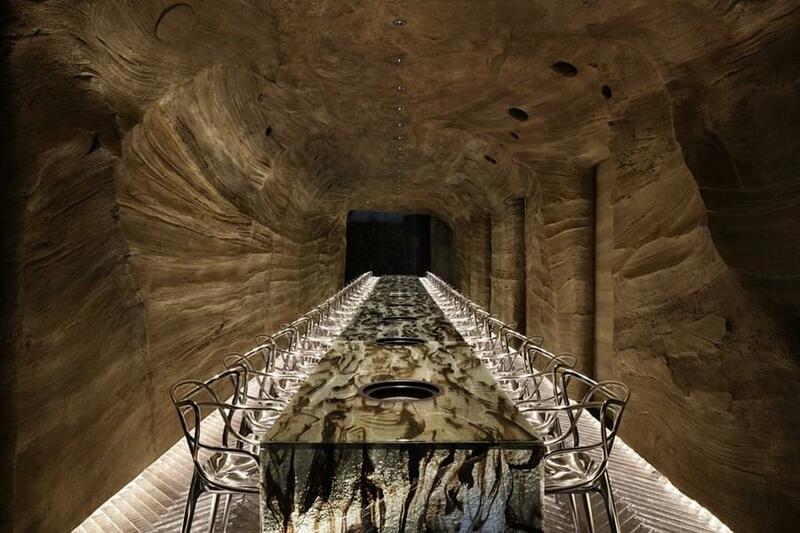 The lower level is reminiscent of a cave with walls and ceilings moulded by hand with mortar. A large mirror creates a feeling of infinity as if the cave went on forever. Under the 6.5meters (21 ft) long smoked-glass table is a riverbed made of recycled-glass gravel with the water created from over 1,000 glass tiles in a flowing pattern. 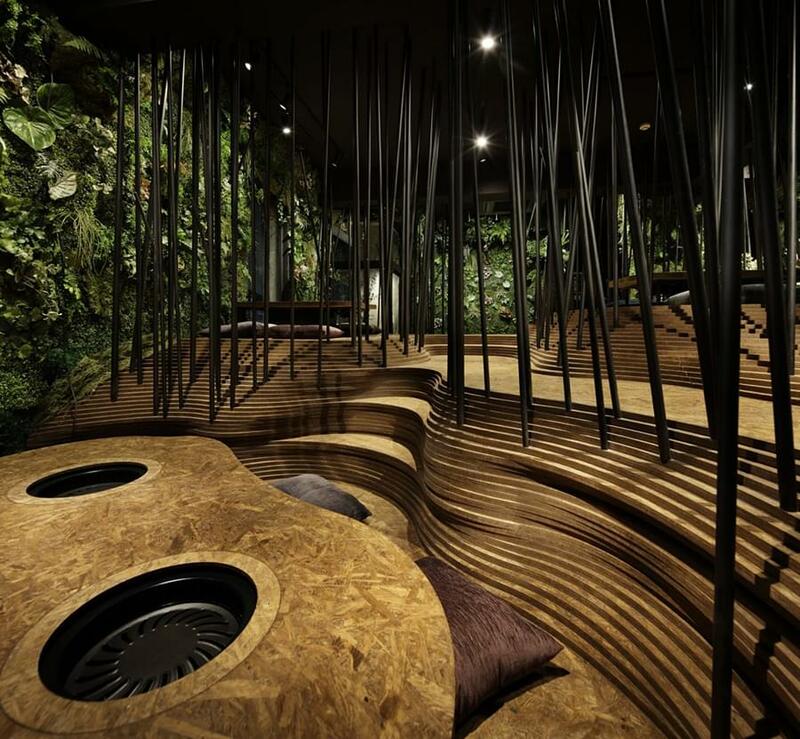 On the floor above, a forest is created of 126 steel pipes that also function as coat racks. Guests sit on the floor on cushions around a low table, just like around a campfire. 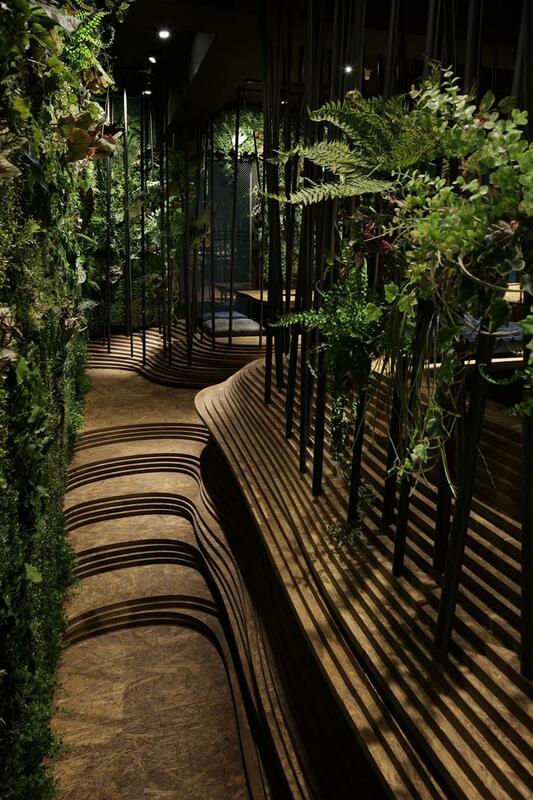 In Nikunotoriko Noppongi Ryoji Iedokoro has succeeded in creating a full-body experience with the food providing the taste and smell, and the environment giving the tactile and visual experiences.